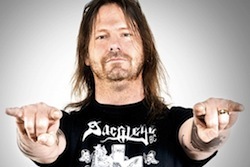 Gary Holt has stated he’d never join Slayer full-time if it meant he had to quit his own band, Exodus. He was hired by the band after guitarist Jeff Hanneman sustained a near-fatal spider bite in 2011, and has been standing in ever since. Although, Holt won’t rule out taking the position on a permanent basis, he says it’ll only happen if he can stay with the band he’s been part of since 1980. Slayer are currently performing with two temporary members after they dropped drummer Dave Lombardo following a contractual disagreement. King recently said he hadn’t spoken to Hanneman “in forever,” leading him to wonder whether he planned to return at all. Good. Exodus is far superior to Slayer and have been for awhile. Want the jeff and save on slayer. Stay in your own bands.